Don’t forget: the books mentioned below are available at 20 percent off for tablehopper readers for two weeks following this mention at Green Apple Books—simply use the code “tablehopper” at checkout (either at the store or online) for your discount. It’s a bountiful season of new releases in the food and cooking section, and here’s a roundup of gift ideas for your loved ones this holiday season, be they kitchen bumpkins or real gourmands. If nothing here catches your fancy, there are a few thousand other options on our shelves, covering everything from drinks to Crock-Pots, vegetarian to Japanese. We hope your holiday season is full of books, good food, and joy. 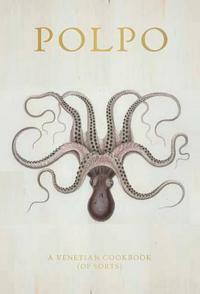 Let’s start with Venetian food by way of London: Polpo: a Venetian Cookbook (of Sorts) by Russell Norman ($50). This is surely the most beautiful book on my list this fall, with exposed spine sewing, plentiful photos of Venice and the featured dishes, and a drop-dead cover. Polpo is a small bacara in Soho (London), and the food is lovingly modeled on these humble Venetian gathering places that hum with conversation, feature simple small bites, and always start with a spritz (Aperol, white wine, soda, lemon, and an olive). The food is stripped down and shareable—Norman quotes Saint-Exupéry: “Perfection is achieved not when there is nothing more to add, but when there is nothing left to take away.” Think Rocket and Walnut Pesto Crostini; or Cod Cheeks, Lentils, and Salsa Verde; or Zucchini, Basil, and Parmesan Salad. Sfiziosimmi! 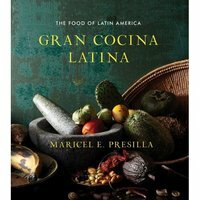 As long as we’re abroad, let’s move on to Gran Cocina Latina: the Food of Latin America by Maricel Presilla ($45), a magnum opus of a cookbook, with 500-plus recipes, 100-plus illustrations, plentiful sidebars, variations, notes, drink pairing suggestions, and so on—for nearly 900 pages (if you braised this book, it would serve at least 12). Throughout, Presilla explores the many recipes, techniques, and ingredients that both unify and distinguish Latin American cooking. The most exhaustive book on the subject I’ve ever seen, Gran Cocina Latina would inspire any curious home cook. 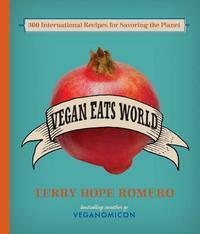 And in the worldly vein, there’s also Vegan Eats World: 300 International Recipes for Savoring the Planet by Terry Hope Romero ($35). It’s a solid collection of 300 recipes of varying complexity from all over the world, from curries to dumplings, noodles to one-pot meals. 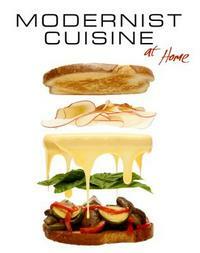 While not graphically stimulating, it’s a no-nonsense recipe book for the vegan home cook. Think of dishes like Andean Ahi Bean Stew, Greek Eggplant Lasagna, or Watercress Coconut Lumpia Spring Rolls. Now on to Jerusalem, properly subtitled a Cookbook, by Yotam Ottolenghi and Sami Tamimi ($35). You might remember Ottolenghi from Plenty, my favorite cookbook of the last several years and my favorite vegetable cookbook of all time. 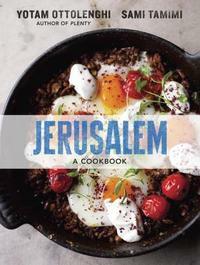 Well here he’s teamed up with Arab chef Sami Tamimi to portray Jerusalem in recipes and pictures, and what splendid flavors burst from these pages—mint, yogurt, lemon, chickpeas, etc. It’s a beautiful hardcover filled with 120-plus cross-cultural recipes that make you want to cook, eat, and travel. Soups, vegetables, meats, savory pastries, condiments—they’re all here. Highly recommended for any adventuresome cook. Closer to home is a general cookbook that evolved from the Smitten Kitchen blog, entitled (wait for it… .) 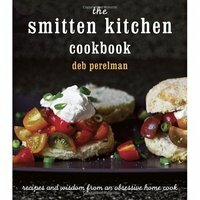 The Smitten Kitchen Cookbook: Recipes and Wisdom from an Obsessive Home Cook by Deb Perelman ($35). This is an almost bossy, straightforward recipe book full of variations on the standards (her grilled cheese is Emmentaler on Rye with Sweet and Sour Red Onions); innovative comfort food (Cheddar Swirl Breakfast Buns); and generally hearty fare (Tomato-Glazed Meatloaves with Brown Butter Mashed Potatoes). Throughout are Perelman’s tips, very personal intros to each recipe, and plenty of luscious photos. A fine gift for the home cook who seeks inspiration. 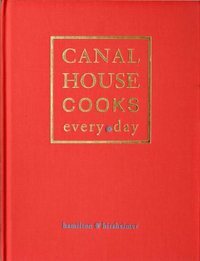 Another collection of recipes that defies easy categorization is Canal House Cooks Every Day by Hamilton and Hirsheimer ($45). This talented duo guided Saveur magazine through the 1990s, and they share a studio and kitchen overlooking a canal near the Jersey-Pennsylvania border. More important, they cook delicious and very doable recipes and photograph them well enough to put your salivary glands on red alert. There’s nothing groundbreaking here—it’s mostly workaday, but flawlessly tested and presented for any home cook who can wield a knife. It’s also beautifully bound in red fabric. There’s comfort food, like the Rolled Flank Steak with Pesto, and lighter dishes, like the Open-Faced Zucchini Omelet—mostly it’s bistro fare. Arranged seasonally but well cross-indexed, this 250-recipe collection will look good on your shelf, and the results will certainly grace your table. Now for the groundbreaking. Last year, a six-volume collection called Modernist Cuisine was released in limited quantities, each set in its own Lucite case. Even at $625, we sold a handful, which is unusual for our humble store and a testament to how many San Franciscans take their cooking seriously. Now there’s Modernist Cuisine at Home. Weighing in at 11 pounds in two parts, Modern Cuisine at Home bridges the gap between cutting-edge cuisine and your home kitchen, as long as you’re willing to cook your sunny-side up eggs in two parts, yolk and white. Want to make your steaks in a sous vide cooler? Check. Pressure-cooked chickpea salad? In there. Onion fluid gel? Page 21! It’s slipcased in two volumes (a perfect-bound oversized main volume of technique and illustration, plus a spiral bound “kitchen manual”). And it’s $140 ($112 for tablehopper readers!). We also have the original Modernist Cuisine if you can afford—and understand—it.